San Clemente is Orange County’s southernmost coastal city. Found midway between Los Angeles and San Diego along the Pacific Ocean coast, it offers great access to the best attractions and amenities the area has to offer. It is also a major surfing destination, boasting several beaches visited by thousands of surfers and water sport enthusiasts all year round. San Clemente is known as the “Spanish village by the sea.” Founded in the 1920s by Ole Hanson, a developer and former mayor of Seattle, the city boasts a stunning landscape of ocean, rolling hills and mountains. It’s dotted with historic Spanish Colonial style homes called the “Ole Hansons”, which were built during the city’s founding. San Clemente was not as popular as its neighbors, San Juan Capistrano and Dana Point, until former President Richard Nixon bought one of the city’s original homes in 1969. Nicknamed the Western White House, the property brought attention to San Clemente, which contributed to the city’s growth and development. While the city’s economic progress may not be dramatic, it offers plenty of employment and business opportunities. It’s the headquarters of large companies like Cameron Health and ICU Medical and is the home several surfing magazines and surfing equipment, manufacturers. San Clemente is considered as one of the most affordable coastal cities in Southern California, but it is also not lacking in multi-million dollar oceanfront estates. There’s something for everyone in the San Clemente’s 9 neighborhoods, ranging from affordable condos to sprawling luxury homes. San Clemente North features single-family homes and condos, most of which were built as vacation homes in the 1960s and 1970s. Gated communities like Sea Pointe Estates and Shorecliffs are where you will find some of the grandest estates in the city, featuring stunning ocean views and expansive lots..
San Clemente Central is located close to the San Clemente Pier, encompassing downtown San Clemente. This neighborhood is the densest part of the city, featuring multi-family residences and mixed-used developments with great views and easy access to the ocean. Southwest San Clemente is closest to the city’s major beaches and offers a wide variety of single-family homes and condos. With their oceanfront location, the homes in this neighborhood are among the priciest in the city, mostly found within exclusive gated communities. Southeast San Clemente offers expansive single-family homes and condos with stunning ocean and/or golf course views. This neighborhood provides easy access to the 5 Freeway. Forster Ranch is one of the largest neighborhoods in San Clemente. The housing stock here ranges from affordable condos and starter homes to luxurious estates. Forster Ranch is the home of The Reserves, which is made up of four waterfront neighborhoods offering spacious, reasonably-priced single-family homes in various styles. Marblehead provides easy access to the 5 Freeway as well as the city’s main streets, Avenida Vista Hermosa and Avenida Pico. While most homes here are single-family residences within gated communities, there are also a few condos offering more affordable options. Rancho San Clemente is home to a wide variety of housing types, including single-family homes and condos in a broad range of sizes and prices, with views of the ocean or mountains. Talega is a recently developed master planned community featuring single-family homes and townhomes with heavy Spanish architectural influences. The self-contained neighborhood boasts 2,000 acres of open space, 19 miles of trails, a golf course, a nature preserve, community swimming pools and more. Coast District is located along a hill, and features large and mid-sized homes with stunning panoramic views of the ocean and the city. 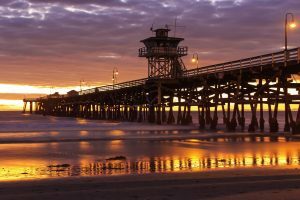 San Clemente is known for its popular beaches, including Trestles, San Onofre, Linda Lane Park Beach and San Clemente State Beach, offering world-class surfing and other water activities, such as fishing, boating, whale watching and more. The city’s beaches are also home to parks, camping grounds and conservation areas that offer great bird and wildlife watching opportunities. Found at the heart of the downtown area, at the center of the city’s coastline, the pier is home to many shops, restaurants, bars and cafes. It’s the starting point of the San Clemente Coastal Trail, which encompasses all the beaches from San Clemente State Beach to North Beach. San Vicente’s commercial corridor is home to many restaurants offering a diverse range of cuisines, as well as several bars where you can party the night away.